The College of Education began a “New Learning Ecology” initiative in Fall 2010. Incoming first year students are invited to bring their own laptop computers or other approved digital devices so that they can learn and practice teaching in a 1:1 computing environment. 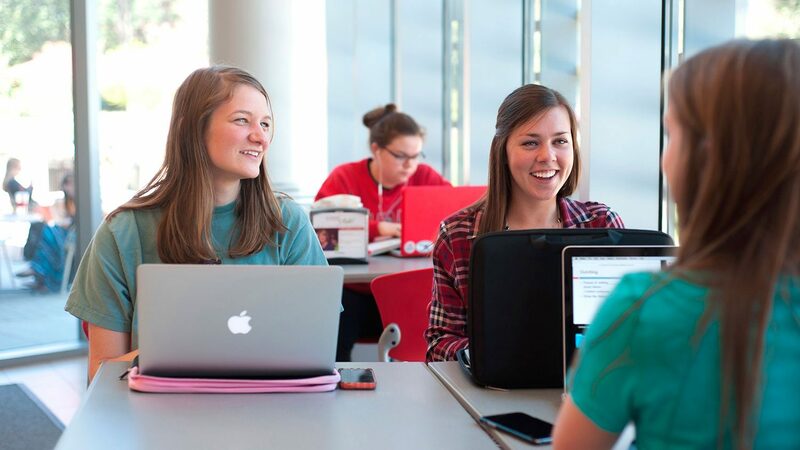 Students benefit from the wireless computing capacity on NC State’s campus and in Poe Hall where atria and classrooms have been upgraded with additional power and new table-top furniture. Laptops are not required in courses until the sophomore year as an undergraduate. However, it is highly recommended to bring a laptop during the first year as it is an asset in all university classes. You can be successful at NC State regardless of the computing platform you choose (Windows, Mac OS X). Campus computing resources are compatible with both of these platforms. When purchasing a Mac, please be aware you may have to purchase a copy of Windows and reconfigure your machine to run some software required in some courses. Bringing a laptop to NC State in the fall does not mean you have to buy a new one. If you own a laptop that is less than two years old, compare your computer to the minimum specifications for owned machines. For the 2018-2019 academic year, OIT has developed the following minimum recommendations, which should be met or exceeded by a new computer that you plan to bring to campus. The greater the capability (processor speed, RAM, disk capacity) and expandability you purchase now, the more likely your computer will be able to meet your future needs. * You will need a wireless card to connect a desktop computer to a local wireless network. **Except for the MacPro desktop, most newer Apple computers have built-in wireless. ***The MacBook Air laptop requires USB Ethernet adaptor. Do some research before you buy. Campus bookstore prices are usually better than public retail prices, but we encourage you to compare market prices for the models. Review vendor quality and service ratings from independent sources such as Consumer Reports. If a deal seems too good to be true, it probably is! Avoid these common pitfalls when shopping for a laptop. A vendor advertises laptops for $500, but when configured with adequate specifications, the price rises significantly. The price does not include a 3-year parts/labor warranty. And, the vendor charges a fee to contact customer support. The NCSU Bookstore offers models recommended by the College of Education and the University that fit our minimum laptop specifications. They can offer a educational discounts on products. Purchasing Online is also available. What should I bring with my computer? If you bring your own computer, be sure to include its associated documentation, warranty information, and backup installation disks. Keep these in a safe place in case you need to reinstall or reconfigure any hardware or software. To discourage theft, it is a good idea to engrave your driver’s license or ID number (NOT your Social Security number) on all computer equipment you bring to campus. NC State Campus Police, building # 238 campus map central, offers engraving services. If you have a laptop, keep a separate record of its serial number and the Ethernet address of any Ethernet card you have. Also see Safe Computing at NC State. You can receive computing assistance with software and minor hardware problems from the Education IT (EdIT) Help Desk. In addition, residence hall support and a walk-in help center are available to all students. The Office of Information Technology Walk-in Center has on-site licensed repair technicians certified to do repairs on any of the vendors that are recommended and sold via the NCSU Bookstores.